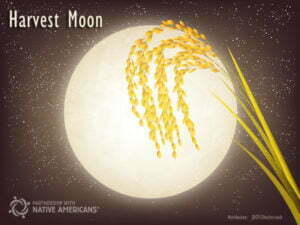 Moon of the Full Harvest, Hopi. Moon where the Corn is Taken in, Pueblo. Throughout the centuries, certain moons were believed to mark the harvest season — the time when most crops were beginning to reach peak ripeness and needed to be brought in for winter or the non-growing seasons. Appearing roughly from August to October, the “harvest moons” are known to many indigenous cultures across the U.S. and beyond. This isn’t as crucial today as it once was, in part due to Thanksgiving. Read more about this in our Thanksgiving blog that will publish next week. Like the harvest, the season of autumn is celebrated in many cultures as a time of change. Some cultures celebrate it as a new year, a time where the old dies and allows for new growth to be let in. For those who still work the lands to grow the foods that their ancestors once ate, the fall harvest is still important. For example, some Anishinaabe still cultivate rice and harvest it at this time of year. Some still pause this time of year, at pow wows and private celebrations, to thank the Great Spirit for a good harvest and surviving another year. Generally, this is done through ceremony or dance. The practice is not as common-place today though, because the fall harvest is not a normal happening for much of the population. Sadly, with this, many no longer stop to notice the significance of the change in the season. In days of old, food was very much a part of the culture. In some ways, the fall or harvest season still connects all of us to our ancestors and our culture, and this is something to celebrate. This entry was posted in Humanitarian and tagged Autumn, Harvest Moon, Harvest Season, Indigenous Cultures, Native American. Bookmark the permalink. Trackbacks are closed, but you can post a comment.